Dietary Interventions in Autism Spectrum Disorders: Why They Work When They Do, Why They Don’t When They Don’t. There is a great deal to praise about this book: the format, the style where science is both readable and comprehensible, the facts, the theories and claims, and a hefty dose of reality. The author makes it clear from the beginning that his book not a weight loss book nor does it tackle the behavioral issues in food avoidance. The fact that he guides the reader to Ernsperger and Stegen-Hanson [Just Take a Bite] assures me that knows what he’s talking about. What I found most alarming was the startling information about how very few studies there have been about dietary interventions and even more shockingly, how small the sample populations were – just 237 candidates for the CF-GF diet – and how many people do you know who have adopted this diet? Furthermore and more worryingly, the candidates are self reporting their results, or rather to be more accurate, their parents are reporting the results. 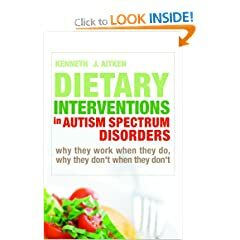 At the beginning of 2011 many people will be considering dietary interventions for their autistic children, in which case, this book is a must read. It has been my opinion for quite some while that since so many of our children have appalling diets that just about any addition to their limited quota must have a beneficial effect. I used to envy other parents embarking upon some new miracle diet with their children while we pushed a Goldfish cracker around the plate and washed it down with his second food, milk, with the hope that at some time during the next 24 hours we’d manage to persuade him to eat dessert, maybe a single raisin, his third ‘food.’ But of course that was a long time ago. I would love to claim sole credit for my desensitization and multiple exposure plan of intervention, but unfortunately there are many other reasons for his improvement: therapists, teachers, aides, life, growth and the passage of time. Posted on January 3rd, 2011.